Leigh Tesfatsion, research professor, has been elevated to the grade of Senior Member in the Institute of Electrical and Electronics Engineers (IEEE). IEEE Senior Membership is an honor bestowed only to those who have made significant contributions to the profession. This decision tool is intended to help farmers who do not currently use cover crops evaluate the expected annual net returns to cover crop adoption under alternative scenarios, and to serve as a benchmark for farmers who are already using cover crops and want to improve the return on their investment. Sher Afghan Asad, Ph.D. student, presented a paper at the Advances with Field Experiments Conference, Oct. 5-6 at the Boston University Questrom School of Business, Boston, Massachusetts. Asad presented “Discrimination in Reciprocity: Evidence from an Online Labor Market." 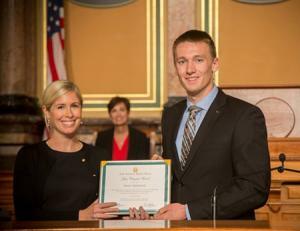 Hans Riensche, ag bus sophomore, was presented the 2018 John Chrystal Award by the World Food Prize Foundation at the World Food Prize Laureate Award Ceremony in Des Moines Oct. 18. 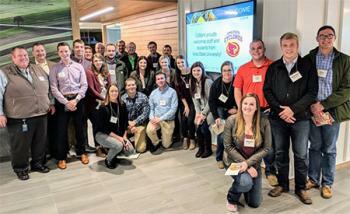 Keri Jacobs, associate professor, traveled with 20 students to visit co-ops in Wisconsin and Minnesota Oct. 17-20, 2018. The economics department 2018-19 Ph.D. job market candidates page is now online. The eight candidates listed are grad students Ahmed Aziz, Mohammad Hasan, Sicheng He, Fang-ge Liu, Jiaoting Shi, and postdocs Minghao Li, Yau-Huo (Jimmy) Shr, and Chuan Tang. Otavio Bartalotti, assistant professor, has a new publication forthcoming at the American Economic Journal: Economic Policy. Alum Rami Maysami ('92 economics) has been named the new College of Business and Economics Dean at Cal State LA. Sebastien Pouliot, associate professor, was interviewed for an Oct. 10 story on MPR News "As ethanol boosters celebrate sales restriction end, skeptics doubt it will help farmers." Elizabeth Hoffman, professor, and Younjun Kim, Southern Connecticut State University, have had their paper "Pre-Play Learning and the Preference Reversal Phenomenon" published in the Southern Economic Journal 2018, DOI: 10.1002/soem.12304. 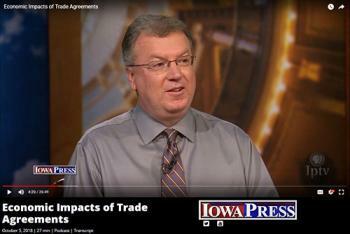 Chad Hart, associate professor, will be a panelist on a forum "The Economic Impact of the Trade War on Iowa" at the University of Northern Iowa's Commons Ballroom at 7 pm Oct. 25. A recent department Ph.D. graduate, Dr. Yu Jin, has died of cancer. He received his Ph.D. from Iowa State in economics in 2012; David Frankel was his major professor. Dr. Ed Balistreri will head CARD’s Trade & Policy Division beginning Jan. 1, 2019. Wendong Zhang attended the National Ag Credit and NC - 1177 joint meeting Oct. 8-10, 2018, at the Federal Reserve Bank, St. Louis, where he was elected President-Elect for NC-1177, which is a multi-state research project sponsored by USDA focusing on agricultural and rural finance markets. Graduate students Albulena Basha and Wendiam Sawadgo presented their research at the National Ag Credit and NC - 1177 joint meeting Oct. 8-10, 2018, at the Federal Reserve Bank, St. Louis. These selected presentations were on the impacts of interest rate hikes and agricultural trade uncertainty on farmland values, and landowners' decisions on conservation practices, respectively. 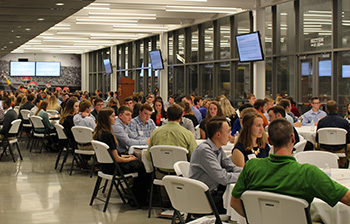 The Agricultural Business Club held their annual Pre-Career Day Mixer Mon., Oct. 8, in the Sukup End Zone Club. Attending were approximately 190 students and 60 representatives of 40 companies that are sponsors of the club. Sebastien Pouliot, associate professor, was interviewed for an Oct. 8 article in the Gazette on Trump's proposed expansion of the use of E15 fuel. 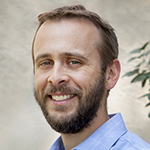 David Keiser, assistant professor, has had two studies published on the environmental impacts and economic efficiency of the Clean Water Act. Elizabeth Hoffman, professor, was interviewed for a Western Courier story on her research on the effects language and word framing can have on patent policy and entrepreneurial incentives. David Swenson, associate scientist, was interviewed by Amy Mayer for an Oct. 8 KCUR story "It's (Not) All in the Family: Outside Help Needed as Farm Operations Grow." Chad Hart, associate professor, appeared on Iowa Public Television's Iowa Press Oct. 5. The Western Illinois University Department of Economics and Decision Sciences will host a presentation by renowned behavioral economist Elizabeth Hoffman at 10 a.m. Friday, Oct. 5 in Stipes Hall, room 121.